A seed knockout wheel is used to ensure that certain seed types are fully released from the seed opening of the vacuum seed disk. Wheel projections engage seed holes, forcing all seeds and foreign material to be ejected. 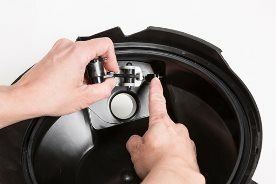 The knockout wheel assembly is mounted inside the vacuum seed meter dome and runs against the backside of the seed disk. With JOHN DEERE EXACTEMERGE™ PLANTER row-unit, the knockout wheel does not need to be changed when switching over crops. Previously, soybeans needed a scraper to be installed. The knockout wheel serves multiple purposes. Not only does the knockout wheel disengage the seed from the disk, it also helps ensure that the seed is placed at the center of the BrushBelt™ delivery system during each handoff. Controlling the seed through 100 percent of the handoff is what allows JOHN DEERE EXACTEMERGE™ PLANTER to be the most accurate meter in the industry. There are no more moments of uncontrolled seed drop from the time the seed is selected to the seed disk and released 5.08 cm (2 in.) from the bottom of the trench.